The Development Office at Warwick School asked us to work alongside them to create a bursary campaign aimed at raising £2.5 million to fund at least 25 new full fee places for deserving boys by 2021. The ‘when action meets compassion’ campaign will provide opportunities, through open access, to talented local boys whose potential is far greater than their financial means. The bursary brochure was very well received and was responsible for a number of new gifts, notably a major donation from an old boy after seeing his friend featured in the brochure itself. The design concept for Warwick’s bursary campaign is based upon the premise that to be an Old Warwickian you will naturally be compassionate – all that is needed now is action. A series of key messages, coupled with thought-provoking photography, explain the benefits of what can happen when action meets compassion. 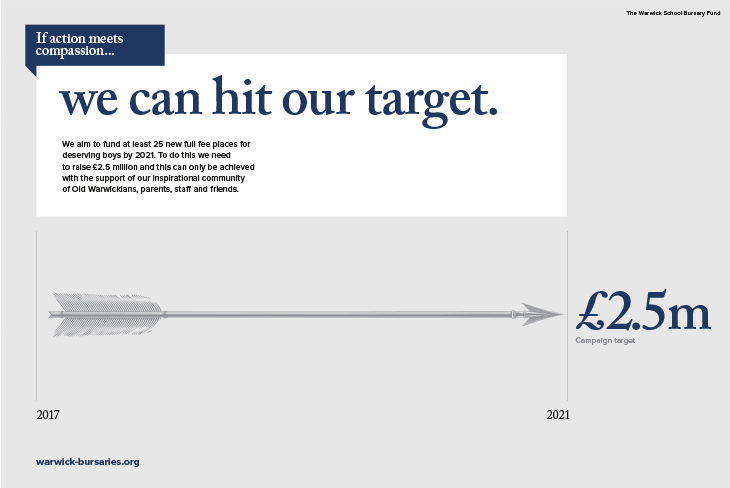 The campaign has got off to a good start and the brochure was used to great effect during the telephone campaign in 2017 with over £100,000 being raised.